Welcome to Episode 1 of Daily Darkness, hosted by Steve Taylor. In this episode of Daily Darkness, our tale of terror comes to us from Chilling Tales for Dark Nights. If you enjoy what you hear, you can listen to more of them on their YouTube channel, at their website, or on Spotify. You can also follow them on Facebook, Twitter, and Instagram to get their latest updates. 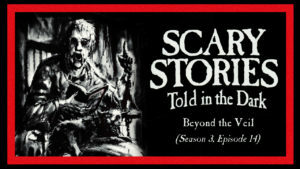 Tonight’s tale was written by author Eric Dodd, and is voiced by a full cast, starring Jason Hill, and featuring Jesse Cornett, Benjamin Lisman, Brindolyn McNair, Eden, Ashley Tolfo, and Alyssa Karr. Original score by Jesse Cornett. Sound design by Jesse Cornett and Felipe Ojeda.